Home / blog / GS HAIR / Hair Color / Hair Color Fade / Why does my hair color fade? Why does my hair color fade? Expert answers from Sacramento’s best salon. Why does my hair color fade? I am asked this question frequently. (Though not often by our salon clients.) So I’ve compiled my list of top 6 reasons hair color will fade. Inferior Color Lines. Whether chosen at the grocery store, (makes us cringe) or having a stylist use an unproven product line on your hair, cheap product lines keep us very busy. We get to fix the results every day. Now, I know you think we just say that drugstore lines are inferior to keep you in our chair. Most of us don’t have the heart to tell you, we can spot box color the minute you sit down. Despite claims of vibrance, longevity and ‘color depth’, no one is going to produce salon-quality results like salon professionals, using good products. We choose our color lines very, very carefully. (We don’t want to have to re-do our own work). 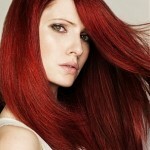 Salon color lines have lower ammonia count and higher quality ingredients than drugstore brands. Expert application and experience plays a heavy hand in that equation as well. Bad Hair Care Products. Believe it or not, the products you use on your hair every day make a huge difference in color fade. We see it in our chair. Shampoos, conditioners, and styling aids without the proper Ph balance can wreck havoc on your color. They cleanse too heavily and will strip the color right from your head. Protect your investment with proper hair care lines. We carry excellent and very affordable hair care lines that will lengthen the time between salon visits. Remember, our clients are walking billboards for us! We want you to look fabulous. Sunshine lovers. Spoiler alert. You knew it was coming. The sun you love to warm your body in, is hazardous to your color. Put on a hat, wrap a scarf, cover it. We know it’s not fun, but those UV Rays will bake your color right off. GS HAIRcan reccomend several UV protecting lines that can help. Salt Water. There is really no easy way around this one. But salt water is detrimental to color. Now I’m not saying you’ll come home from your next surfing trip with white hair, but you will definitely see some fade. If you’re laying in the sun afterward it’s going to fade even faster. Put your hat on and enjoy your color longer. Salt water and sun can also bring unwanted brassiness to your highlights. Chlorine and Swimming Pools. That sweet dip of cool water on one of Sacramento’s blistering hot summer days is certainly something to look forward to. But not for your hair. To combat chlorine fatigue, make sure to soak your hair in fresh water both before and after you swim. The water before hand will prevent as much from soaking in. The water afterward, will help the chlorine that has accumulated in your hair rinse out. A gentle wash after your swim always helps as well. And deep conditioner to prevent absorption during your next swim. Medications deserve an honorable mention on the list. They don’t necessarily fade hair color, but they certainly contribute to the results we can achieve. We often see this from women being treated with hormones for menopause, fertility and even birth control. We also see it in cancer patients undergoing chemotherapy and radiation. Keep your color fantastic this year with an ounce of prevention. Come see Greg at GS HAIR for free consultations. We are always happy to give advice on new styles, lengths, recommendations on hair color, help solving problems, even product recommendations. And we are never pushy, assertive or snobby. Most days you can stop by for quick questions without an appointment. We can’t wait to meet you!